Lighting up the night sky, a United Launch Alliance Atlas 5 rocket boosted a $245 million Global Positioning System navigation satellites into orbit Friday night, the seventh of 12 upgraded navigation beacons joining a globe-spanning constellation serving military and civilian users alike. The towering Atlas 5's Russian-built RD-180 first-stage engine thundered to life with a rush of bright orange flame at 11:23 p.m. EDT, generating 860,200 pounds of thrust. An instant later, the rocket began slowly climbing away from pad 41 at the Cape Canaveral Air Force Station. Leaving a crackling roar in its wake, the 189-foot-tall rocket put on a dramatic evening show as it consumed its load of liquid oxygen and kerosene rocket fuel, exceeding the speed of sound in about 73 seconds as it knifed through low clouds and arced away to the east over the Atlantic Ocean. 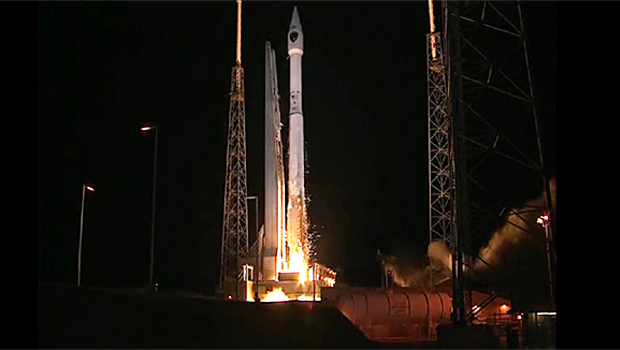 The RD-180 appeared to perform flawlessly, shutting down about four minutes after liftoff. A few seconds later, the first stage fell away and the single Centaur second stage engine ignited to continue the climb to space. The hydrogen-fueled RL10A-4-2 engine burned for about 12 minutes and 50 seconds, shutting down as planned a little more than 17 minutes after launch. A second 1.5-minute firing was planned three hours later to complete the launch phase of the mission. The rocket's satellite payload was expected to be released about five minutes after the second burn. The GPS 2F-7 satellite is the seventh of 12 state-of-the-art "block 2" navigation satellites built by Boeing that provide more accurate position, elevation and velocity data using more precise on-board atomic clocks. The new satellites are more resistant to enemy jamming and feature a civilian "L5" signal for use by commercial aviation and to aid search and rescue operations. The first block 2F GPS was launched in 2010. The two most recent satellites, GPS 2F-5 and 6, were launched in February and May by ULA Delta 4 rockets. The eighth in the series is scheduled for launch in October with the rest going up in 2015 and 2016. The spacecraft are operated by the 50th Space Wing at Schriever Air Force Base, Colo.
"GPS is a system of satellites, ground stations and user equipment that produce the signals needed to enable positioning navigation and timing services to users worldwide," Air Force Col. Bill Cooley, director of the Global Positioning System Directorate, told reporters before launch. "The GPS constellation is healthy, robust and more capable than it has ever been in GPS history." The Global Positioning System is built around a constellation of at least 24 satellites in 12,500-mile-high orbits that circle the globe in six orbital planes. At least four GPS satellites are always above a user's horizon as viewed from any point on the Earth's surface. Ultra-precise timing and position signals constantly transmitted by the satellites can be combined in GPS receivers on the ground, at sea and in the air to compute a user's latitude, longitude, elevation and velocity. Civilian users can utilize a single data stream from each satellite to pinpoint their positions within about 26 feet, worst case. Military users can receive two channels per satellite for more accurate results. "GPS is absolutely the gold standard for the position, navigation, timing capability across the world. And oh by the way, it's free. That's not a paid political announcement, it is free," Gen. William Shelton, commander of Air Force Space Command, said during a Space Symposium speech. "There are civil, military, commercial uses that abound. It's a $110 billion industry right now. Five hundred million cell phones are GPS-enabled just today. The military dependence on the timing signal from GPS, as well as the positioning and navigation capabilities from GPS, just flat enables precision warfare. Everything we do employing weapons any more seems to somehow involve GPS." That very dependence, however, has raised questions, which Shelton acknowledged during a more recent speech earlier this year. "We've got 31 operational satellites right now, but we've also got a huge military dependence on GPS," he said. "Is it too much? That's the question we need to ask, and it's being asked across the Department (of Defense) today."